Abstract: Now, many kinds of apps are on our mobile phones to make our daily life more convenient. Airwheel specializing in smart vehicles and integrating R&D, design, manufacture and sale is praised as a leading start-up enterprise. Its products have many unique features and the mobile App is one of them. Riders can download Airwheel mobile app from its official website by scanning its QR code (www.airwheel.net). After installing the App, riders can find there are two options: intelligent helmet (C series) and intelligent scooter (except the C series). And the initial password is 1111 1111 for intelligent scooter and 1234567890 for intelligent helmet. It is fun, playful, and trendy. 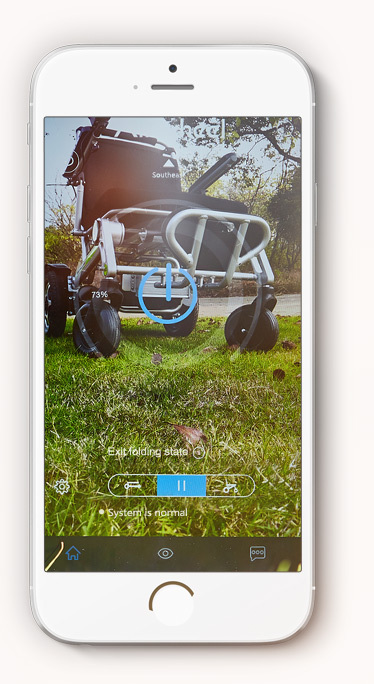 Connect your e bike to your mobile device to see how long it takes you to cruise to your favourite spots in town with the Official Airwheel App. On the homepage, you can see the current riding speed and mileage and also you can lock Airwheel smart mars rover and turn on/off lights easily by tapping the screen. Drawing out the sidebar, you can check information about battery, voltage, help & support. You can check locations through the GPS, and track traveling path. Rides can change wallpapers and set speed limit and headlights according to personal favour. For the C series of smart helmet, riders can control the video, take pictures and retrospect the wonderful images via the mobile App. Now the upgraded App allows riders to build a community and the IM social system is designed for riders to communicate and share photos on the way, etc. The mobile App fault self-diagnosis guarantees riders' safety before travelling and the attentive intelligent design to set the speed level is easy to control even for the first riding. Moreover, the newly released Airwheel H3S manual and power wheelchair has installed newly developed intelligent control system and its App has more features—remote power on/off; fold/unfold with one button which change H3S smart chair to your smart toy. It will come to you by remote control and three different remote controls are available. With the improvement of the products, the Airwheel mobile app becomes better and better, aiming to make the riding experience more convenient and safer.